Maybe the most important and impressive fireplace cooking accessory (although a fireplace grill is pretty great too!) is the fireplace rotisserie. Not only is it functional, easily roasting evenly cooked, juicy roasts in your fireplace, but it is also impressive looking. Most people probably haven't even considered that you can rotisserie cook things in front of your fireplace, but this device makes hearth cooking not only possible, but easy and fun. 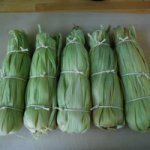 Okay, so you want to start getting into hearth cooking. Where to start? As you've probably read already, there are several options, including a fireplace grill or string-turned roasts. 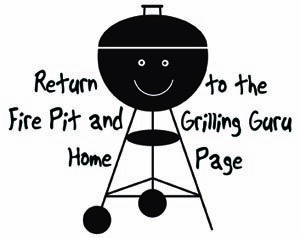 But some types of food and some fireplaces make a grill or string-turning difficult or impossible. The solution? You guessed it, a fireplace rotisserie. What are some of the advantages of a fireplace rotisserie? A grill fireplace cooking accessory is great for searing and grilling smaller pieces of meat and vegetables as you would on a grill or fire pit. However, it is not ideal for larger, slow cooked roasts like whole chicken or other poultry. A rotisserie is a fireplace cooking accessory which is absolutely perfect for slow-cooked larger roasts! 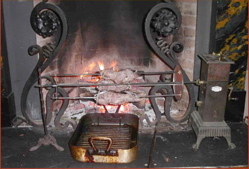 String-turned fireplace cooking is great for large roasts like chicken or leg of lamb, but it takes a bit more inventiveness and you need a good solid area to anchor your hook to hang your roast from. If you don't have a wood fireplace mantle, it may be hard to do. Also, if you have a framed front to your fireplace, you can't put a drip pan directly beneath the hanging food and therefore a string-turned roast is messy or simply unreasonable. A fireplace rotisserie simply sits on the ground in front of your fireplace, easy, no mess and no installation neccessary. Seems obvious, but it slowly turns your food for you. The result? Perfectly roasted hearth cooking. 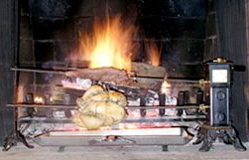 Most fireplace rotisseries also allow you to rotisserie items you may not be able to string-turn easily, such as vegetables, small game birds, and pork loin. Because you are skewering your food on the rotisserie spit, you don't need to get fancy with tying up your roasts and finding a way to hang them. Simply slip them over the spit rod and put it on the rotisserie fireplace cooking accessory. Rotisseries are versatile. 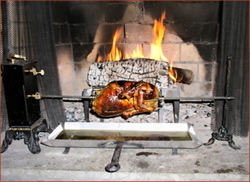 Most hearth rotisseries also come with two separate spits, so that you can rotisserie cook two roasts at the same time. One can have your vegetable kabobs and the other your lamb. Or one has a pork loin and the other a chicken, as seen above. The combinations are endless. Finally, because they are portable and not permanently installed, you can take your fireplace cooking accessory with you. Whether taking it to the summer cabin, to a friend's house or even to cook on your outdoor fireplace, a fireplace cooking rotisserie can go with you. The best place I know of to buy a fireplace rotisserie (and they are hard to find, let me tell you!) is SpitJack.com. 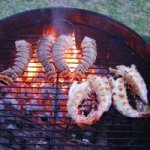 They have a selection of beautiful and functional fireplace cooking accessories as well as fire pits and other fire and fire cooking related accessories. 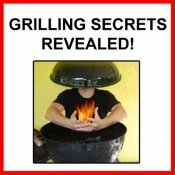 Done learning about the rotisserie fireplace cooking accessory?